PittPharmacy is proud to be the FIRST pharmacy school in Pennsylvania and in the nation to have a pharmaceutical research project on an upcoming space mission! 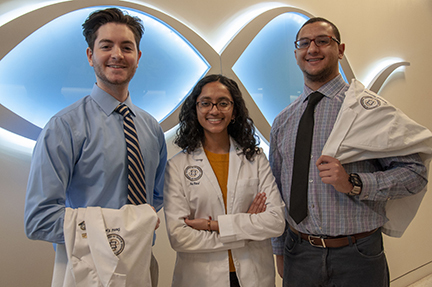 The Student Spaceflight Experiments Program(SSEP) has accepted a proposal project from the winning team of PharmD students David Katz, Anu Patel and Mohamed Kashkoush (Class of 2021). Their research proposal titled Transcriptomic Analysis of Escherichia coli Response to Ciprofloxacin in Microgravity will investigate the antimicrobial resistance in a closed, high-touch environment aboard the ISS and other space vessels, combined with increased bacterial virulence and human immunosuppression during spaceflight under microgravity conditions. Specifically, the proposal aims to determine the transcriptomic changes that occur in Escherichia coli with exposure to ciprofloxacin in microgravity. The project is now in the first phase of the program with an expected launch date of Summer 2019. SSEP was designed to be a keystone initiative for U.S. National STEM education (Science, Technology, Engineering, and Math) and to help inspire America’s next generation of scientists and engineers.